Knowing what your customers or clients think of your business is the only way that you can hone your skills and perfect your business. But most people are very slow to give feedback. For some reason most people don’t take the time to review a business online, and when they do it is usually because they had such a negative experience that they want to warn others away. The saying goes: do a great job and a happy customer will tell 3 people; do a terrible job and an unhappy customer will tell 20. 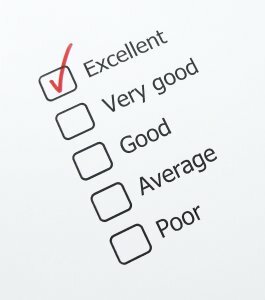 So how do you get customers to actually give you feedback? There are a few ways to do so. There are so many different ways to survey people. You can go old school and have them fill out a card before they leave your store or office. They simply write down their thoughts, or select from your multiple choice responses. The problem you run into, however, is that most people don’t want to give negative feedback right in front of you. Even if there is a secure deposit box, they feel that you might open it as soon as they are out the door. To combat this, you can have the cards come with pre-paid postage. They can drop the card in the mail when they get home. Instead of worrying about all of that, however, you can direct them to fill out a survey online. There are numerous free survey resources like SurveyMonkey and Freeonlinesurveys.com. You may end up with a lower response rate since people will forget to take the survey as soon as they are out the door. Creating a Facebook page is completely free. All it takes is a little bit of time to set it all up. It is a fantastic way to keep your clients and customers engaged, keep them coming back for more, and illicit a response. Facebook has a way for everyone to rate your business. They can give you 1 to 5 stars, and leave comments. Even if they don’t want to rate the business, they can always leave comments and questions on the page. It’s an easy way to interact with customers, and they can give feedback from the comfort of their own home. Your business should be on Yelp. Around the country this site is where people go when they want to know if they should utilize a business. Here’s the thing: even if you don’t create a business page, someone can do it for you. Your business can be reviewed on Yelp without you even signing up for Yelp. If this has happened, you can claim the Yelp listing and take over management. But those reviews are going to stick around. If they’re negative, you should work on making things right. A bad review that has been remedied is worth much more than a good review. Similar to the survey idea, you should have a place where your customers and clients can fill out comments. Most people would like to give feedback if given the opportunity. This one is simple and straightforward. Leave comment cards near the door, so as people are leaving they can fill on out and drop it in the box. There’s no reason that you can’t just straight up ask your clients and customers for feedback. Before they leave ask if they are happy with the service. Ask if there is anything that you can do to make things better. Ask them if they would be likely to refer a friend, and if not, what you can do differently to encourage them to refer a friend. When asked in person, people will sugar coat things. They don’t want to hurt your feelings, and would rather tell you a half truth than something they think you don’t want to hear. For instance, when asked, “What did you think?” a client may respond, “Your office is very nice.” Instead of saying that they thought your service was lousy. As a full service accounting firm in Billings, Montana, we aren’t really in the business of supplying surveys. But we can help you make sure that your business is running smoothly. We offer everything from tax preparation, to payroll services, to business consultation. By taking those worries off your plate, you can focus on the driving force behind your business: the customer. 406-894-2050.